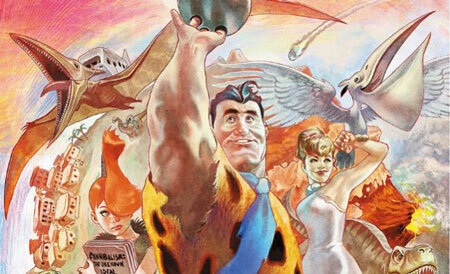 One breakout hit comic of the past year is DC’s The Flintstones, by Mark Russell and Steve Pugh. This week, Tim and John Roberson talk with Pugh about the challenges of adapting the 1960s characters to a slightly more serious art style and discuss writer Russell’s decidedly different take on this classic Hanna-Barbera property. Patrons can hear a bonus review of Flintstones #12 on Patreon! Comic book round table. This week, we have – the Accused #1, the Flintstones #2, Lady Killer 2 #1, Spider-Man Deadpool #7, All Star Batman #1, and more ……….. Comic News Insider: Episode 332 is now available for free download! Click on the link or get it through iTunes! Sponsored by Dynamic Forces. Jimmy is out at the bar and who better to join him for drinks and hosting than Grace Helbig! You remember when she and her comedy partner Michelle co-hosted back in Episode 323. We bring a little bit of Grace’s web show, The Daily Grace, to the podcast as well! They chat about some TV season finales, the Smallville series finale, Bryan Fuller in town and drinks! We also plug a new show called Planet Bugle coming soon to a TV near you! News includes: the official Castle comic book, new Wonder Woman TV show is not picked up, Seth MacFarlane to re-vamp The Flintstones, Trickster comes to SDCC, and a Batman first-person shooter! As always, the Top 3, listener feedback and more! Leave your iTunes comments! 5 stars and nothing but love!